Enjoy the freedom of having a set of items to either keep together or have all throughout the house with this the planter set. It can serve a variety of purposes. 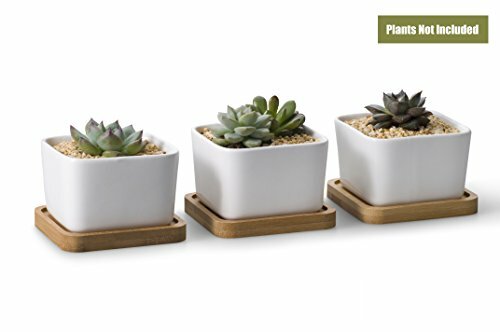 This set of items features 3 white ceramic square pots, each with a water draining hole at the base for appropriate draining of plants such as succulents, cacti, flower buds and almost any miniature indoor plants. Each pot set includes a bamboo tray which can help it steadier. You can display it on any counter, deck railing, tabletop, or windowsill to bring the perfect combination of natural beauty and stylish charm to any space. Give this planter set as a sweet gift to a friend with a green thumb! NOTICES: The items might collect dirt in the process of packaging and shipping, so please clean and wash the product when you receive it. Then because the base is made of bamboo/wood, we cannot guarantee each of these have the same pattern, thanks for understanding. Set of 3 white ceramic plant pots all feature holes at the bottom for proper draining of live plants. If you have any questions about this product by Opps, contact us by completing and submitting the form below. If you are looking for a specif part number, please include it with your message.